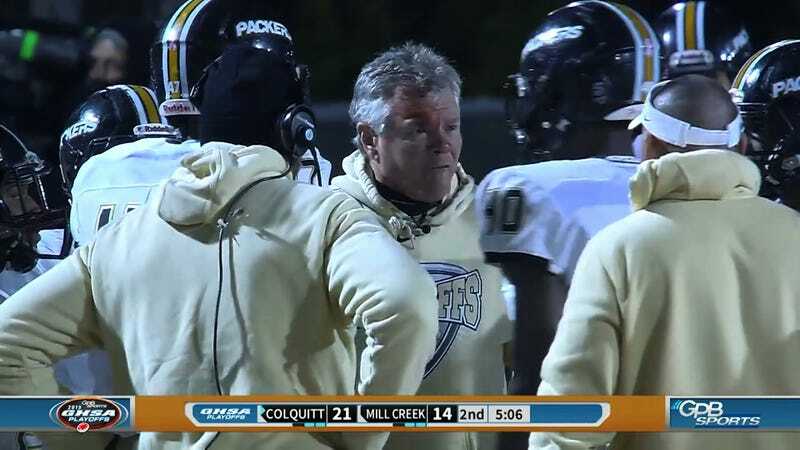 Colquitt County (Georgia) High School football coach Rush Propst has been fired after 11 successful seasons, following an investigation which determined that the 61-year-old coach had given pills to students, overstepped his position in at least one school personnel matter, and attempted to use school funds for a personal hotel. The Moultrie Observer received a copy of the investigation’s findings, and reported that Propst also owes hundreds of thousands of dollars in federal and state taxes. Providing pills “on more than one occasion” to students. None of the documents identifies the type of medication, except for one witness who said the pills he saw “might have been Aleve,” which is an over-the-counter pain killer. Owing $301,317 in federal income taxes and $143,000 in delinquent state taxes. Interfering in the hiring of Jamie Dixon as the Colquitt County High School principal. Attempting to charge $143.66 for a personal hotel stay to the school system. “The evidence showed that on one occasion he gave a pill to a student at halftime and the student was observed by medical personnel who described him as dazed and lethargic after getting the pill from Coach Propst,” the investigation report said. The incident occurred during a 2012 game against Thomas County Central in which an injured player was given an unidentified pill. Although Propst told the team doctor he would no longer hand out pills, three assistant coaches said he did it again in the 2018 season. As for the back taxes, Propst owes almost $450,000, dating back to 2010. At the time of his dismissal, he was making a state-high salary of $141,000 per season, according to First Coast News. His other violations of the Georgia Code of Ethics for Educators include interfering in the hiring process for Colquitt County Principal Jamie Dixon in 2018, and trying to pay for his hotel in Atlanta on the day of last year’s SEC title game with school funds. Propst took over as head coach at Colquitt County in 2008, after he resigned over a different scandal at Hoover High School in 2007: He admitted he had fathered a child outside of his marriage. In 11 seasons at Colquitt County, he racked up a 119-35 record, and won consecutive state championships in 2014 and 2015, repeating the feat in 2017 and 2018. Propst also made the rounds in 2015 when he headbutted a Colquitt County player during a late-season game. The coach was initially suspended for the 2016 season for the freakout, although the punishment was later reduced to a reprimand.